When the malfunction is not confirmed in the dtc check, troubleshooting should be carried out in all the possible circuits considered as causes of the problem. In many cases, by carrying out the basic engine check shown in the following flowchart, the location causing the problem can be found quickly and efficiently. Therefore, using this check is essential in the engine troubleshooting. : carry out this check with the engine stopped and ignition switch off. 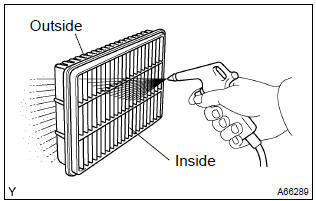 Visually check that the air filter is not excessively dirty or oily. : if necessary, clean the filter with compressed air. First blow from the inside thoroughly, then blow from the outside of the filter.